This is a scalable context timeline. It contains events related to the event (Shortly After 10:32 a.m.) September 11, 2001: CIA’s Counterterrorist Center Director Is Unable to Provide Much Information about the Attacks. You can narrow or broaden the context of this timeline by adjusting the zoom level. The lower the scale, the more relevant the items on average will be, while the higher the scale, the less relevant the items, on average, will be. CIA Director George Tenet is given copies of the passenger manifests for the four planes that were hijacked this morning. [Daily Beast, 8/12/2011] Tenet is currently in the CIA’s printing plant, where a makeshift operational facility has been set up, after evacuating from the agency’s headquarters building this morning (see (9:50 a.m.-10:00 a.m.) September 11, 2001). [Tenet, 2007, pp. 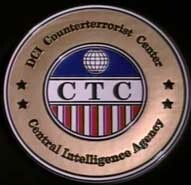 164, 167] Earlier today, Richard Blee, chief of Alec Station, the CIA’s bin Laden unit, asked the FAA liaison at the Counterterrorist Center (CTC) at CIA headquarters to let him see the manifests for the hijacked planes, but the liaison refused. Blee therefore asked FBI agents deployed to Alec Station to see if they could get the manifests through their channels (see After 10:03 a.m. September 11, 2001). President Bush asks Mike Morell, his CIA briefer, who is responsible for today’s attacks on the US and Morell says he is sure al-Qaeda is to blame. 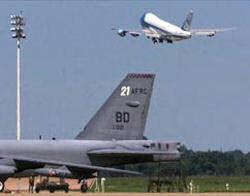 About 15 minutes after Air Force One left Barksdale Air Force Base (see 1:37 p.m. September 11, 2001), White House chief of staff Andrew Card enters the staff section of the plane, where Morell is seated, and tells Morell that the president wants to see him. 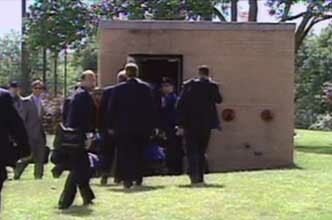 Morell goes to Bush’s office, where he then sits alone with the president and Card. CIA Briefer Says He'd Bet Al-Qaeda Was behind the Attacks - Bush wants to know who Morell thinks is responsible for today’s attacks. “Michael, who did this?” he asks. Morell explains that he doesn’t have any intelligence indicating who is to blame, so he will simply provide his personal opinion. “I said that there were two countries capable of carrying out an attack like this, Iran and Iraq, but I believed both would have everything to lose and nothing to gain from the attack,” he will later recall. The culprit was almost certainly a non-state actor, he says, adding that he has no doubt that the trail of evidence will lead to the doorstep of Osama bin Laden and al-Qaeda. “I’d bet my children’s future on that,” he says. 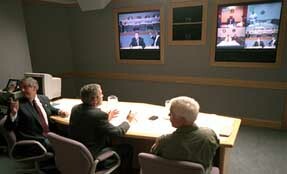 Exercise Means Extra People Are in the Command Center - The command center, according to author James Bamford, is “a cavernous two-story war room with banks of dark wooden desks curved away from a giant projection screen on which [is] displayed the status of military forces around the world.” [Bamford, 2004, pp. 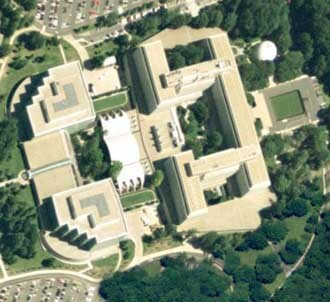 89] Eight giant video screens are loaded with data and numerous military personnel are seated at computer terminals that are hooked into satellites monitoring activities around the world. [Washington Post, 1/27/2002; Omaha World-Herald, 2/27/2002] Stratcom was in the middle of a major training exercise, called Global Guardian, when the attacks began this morning (see 8:30 a.m. September 11, 2001 and Before 9:00 a.m. September 11, 2001) and consequently many more people are in the command center than would normally be there. Brian Stafford. 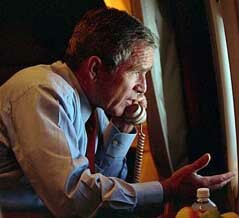 [Source: Publicity photo]President Bush reportedly had begun his video conference call with the National Security Council (see (3:15 p.m.) September 11, 2001) by announcing, “I’m coming back to the White House as soon as the plane is fueled. No discussion.” [Clarke, 2004, pp. 21] Toward the end of this meeting, around 4 p.m., Secret Service Director Brian Stafford tells Bush, “Our position is stay where you are. It’s not safe.” The Secret Service reportedly wants to keep the president where he is, at Offutt Air Force Base, overnight, and—according to some later accounts—indefinitely. To Stafford’s surprise, Bush ignores his advice and tells him, “I’m coming back.” Leaving the meeting, Bush tells his staff, “We’re going home.” [Daily Telegraph, 12/16/2001; Sammon, 2002, pp. 123; Woodward, 2002, pp. 28] Bush adviser Karl Rove later claims that, around this time, there are concerns that several planes still remain unaccounted for (see (4:00 p.m.) September 11, 2001). Fax Includes All of the CIA's Information on the Attacks - A few minutes after Air Force One took off from Offutt, heading for Washington, DC (see (4:33 p.m.) September 11, 2001), Morell received a six-page fax that included all the intelligence the CIA had relating to the attacks. It included the talking points Tenet used to brief Bush during the teleconference, along with a lot of information Tenet was unable to cover in the meeting. Morell read through the material several times and highlighted several passages.